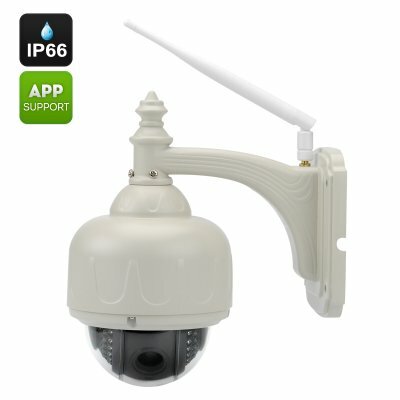 Successfully Added 720P Waterproof IP Camera - PTZ, 4X Zoom, Auto Focus Lens, IR Cut, 20m Night Vision, Android and iOS Apps to your Shopping Cart. The 720P waterproof IP camera is a simple and efficient security tool to protect your home, office, storage or other property against unwelcome visits. Having an IP camera on your property has proved an effective deterrent against burglaries and trespassing. The 720P Waterproof IP Camera comes with a 12 months warranty. Brought to you by the leader in electronic devices as well as wholesale waterproof IP cameras..
fast shipping to Belgium this time, just one week to deliver. Good pictures, easy to setup and install. Extremely fast shipping to USA 2 days. They weathered a 2 foot blizzard and -7 F temperatures and holding strong!! Very easy to set up, good picture and good performance.